In defence of the UPX subsidy. The UPX makes a stop at Weston Station. All forms of transportation are subsidized in Ontario, including our roads. Each TTC fare is subsidized by the city to the tune of around 89¢. GO Train passengers are also subsidized by about the same amount. In contrast, on the Sheppard Subway (Line 4) property tax payers fork over about $10 for each passenger’s ride. The one-stop Scarborough Subway with its $3.5 Billion capital cost will need big subsidies to support the paltry 2300 riders a day expected to use the boondoggle service (compared to over 7000 a day currently on UPX). One can argue that the extra burden of maintenance, traffic control, police supervision, accidents, deaths, sprawl and pollution make roads a poor bargain. Adam is correct that our accidental commuter train to the Airport or downtown is heavily subsidized. For the moment, Metrolinx is being coy about UP Express subsidies, probably because they are so high. Let’s remember that UPX was designed as a premier experience and not expected to break even for several years. The model was flawed, based more on wishful thinking than actual need. People stayed away in droves thanks to high fares. The (not so) mysterious absence of the executive types who could afford the service meant that trains ran empty all day long. Thanks to high staff levels, capital and running costs, estimates placed the subsidy at around $50 per trip. Now that fares have come down and ridership has tripled, the subsidy may have eased somewhat. The cost of running UPX was $63.2 million last year. Now that prices are affordable, the boutique service levels and running costs could probably be lowered. No doubt with increased ridership, subsidy levels could approach those of the TTC. The bottom line is that the UPX isn’t going away anytime soon and it provides a huge benefit to our community. Lord knows City council seems to begrudge any money spent on Weston. It’s nice to enjoy this large, if accidental, benefit from the province. Long may it last. Extra credit: read this 5 year-old article on the UPX from our archives for some interesting viewpoints and statements from that time. High Speed Rail – bring it on! I am going to take the opposite viewpoint to my esteemed colleague Adam on this topic. Here’s the ‘good cop’ version. David Collenette was the man behind the UP Express, having first proposed it 20 years ago. His original vision was for a direct train that would offer a 22-minute ride from Pearson to Union that would cost $20. Without going into the details of what happened between concept and reality (read our back issues), the end result was that Weston in effect ended up with an all-day commuter rail service into Toronto for about the same price as a GO Train ticket. Collenette has re-emerged as a ‘Special Advisor’ in a report outlining a vision of a high speed rail line joining Toronto and Windsor. Lord knows how hard it is to get anything built in this neck of the woods. Collenette’s vision of the Air Rail Link (as it was then known), ended up as a huge gift for Weston’s commuters. Now on the wildly popular UP Express (since lowering prices), in rush hours, it’s standing room only. What about the Toronto to Windsor HSR Line? It’s certainly needed. In fact, decent rail links all over Canada are needed. Part-way to Windsor lies Canada’s Silicon Valley in the Kitchener / Waterloo area. It’s too close to fly there (only 100 km) yet GO Trains take at best 2 hours. An HSR train would use much of the same corridor and cut travel time between the two city centres dramatically. Stops at Malton (Pearson), Guelph, Kitchener and London are proposed for the first phase. The HSR route will use the UP Express corridor. Click for larger view. What’s in it for Weston? 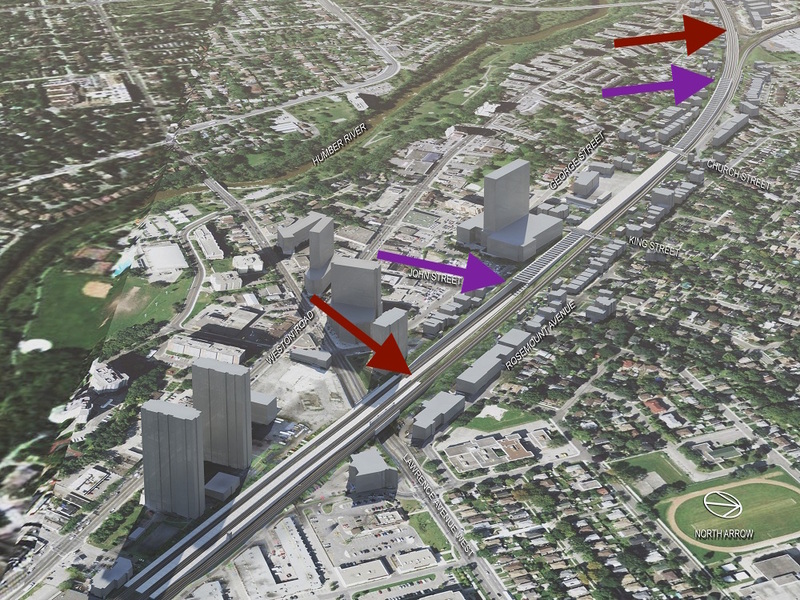 In 2021, the UP Express will add one more station at Mount Dennis and connect to the new Crosstown Line. Will this new station make the UP Express unacceptably slow? There is a rumoured possibility that Weston’s station will be too close to Mount Dennis and may be closed as a result. •Clarify the mandates of GO RER, UP Express and HSR on the corridor. •Assess ridership and service frequencies. •Recommend how the Province might optimize GO RER, UP Express and HSR ridership to maximize the benefit to Ontarians. One way around the two station dilemma might be to convert the existing UP Express into a commuter line and open new stations along the way. This could be a way of easing the burden on the subway system while preserving Weston’s regular and rapid link to downtown. What will the cost be? Anyone who has done home renovations will know that estimated costs before a project begins are likely to end up higher in reality. What studies do show is that public transit adds value to a community if done well. No doubt changes and variations are up for grabs as they were with the original idea for the Airport Rail Link. What about a high speed train running through our community? The train won’t likely be that fast in the city. Currently the UP Express hits speeds of up to 130 km/h between Bloor and Weston for an average of around 77 km/h. The report projects a somewhat faster average speed (just under 100 km/h from Union to Malton). Travel times for the faster of the two HSR scenarios. Click for larger view. The next steps will be more studies and consultations. This is just the beginning of what will be a long and ambitious project. While there may be pitfalls along the way, there will be opportunities and this proposed infrastructure holds huge promise and potential for Weston. We do however need to be on top of this as a community and make sure that the people of Weston / Mount Dennis are heard loud and clear. Author Roy MurrayPosted on May 19, 2017 November 21, 2018 Categories Funding, GO Train, Infrastructure, Mount Dennis, News, Opinion, Pearson Airport, Trains, UP ExpressTags Air Rail Link, GO Train, metrolinx, Toronto, Union Station, UP Express1 Comment on High Speed Rail – bring it on! Weston Farmers Market has finally moved to its designated temporary location in the UP Express parking lot on Weston Road south of Lawrence. 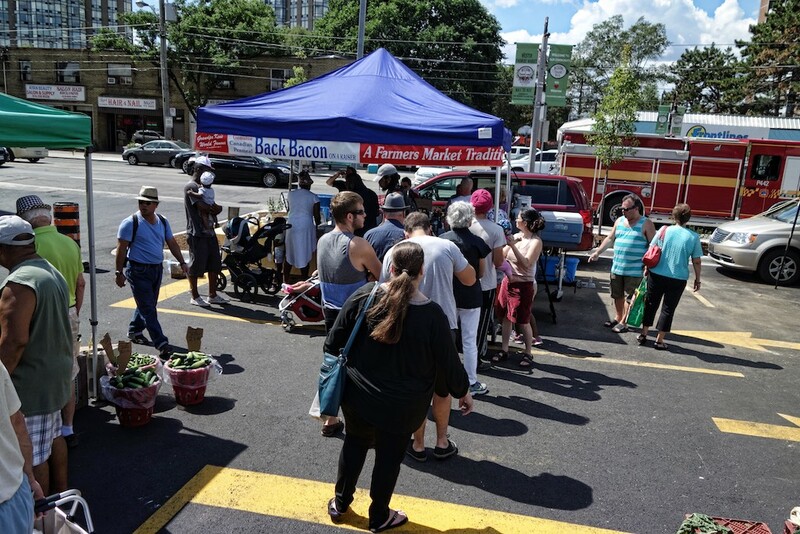 As readers know, this year, the market had to find a new home as the old site was sold by the Toronto Parking Authority and is being ‘developed‘. Metrolinx was persuaded to allow the market to use its UP Express parking lot but unfortunately dragged its feet and didn’t have the site ready for the market until late last week. Thanks are due to MPP and provincial cabinet minister, Laura Albanese for applying pressure on behalf of the market through many letters to Metrolinx. 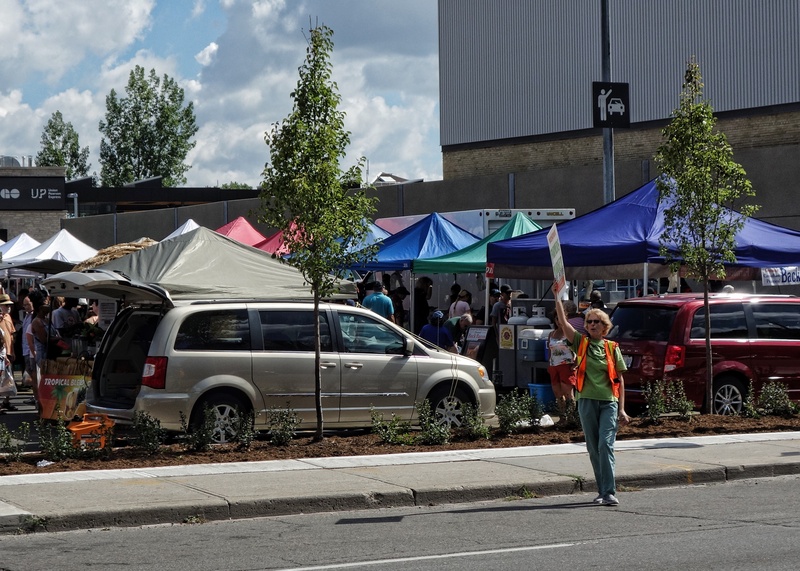 Thanks should also go to Weston Park Baptist Church who, when asked, donated their parking lot to the Market while the Metrolinx site was unavailable. Weston B.I.A. Chair Masum Hossein tells me that without Weston Park’s generosity, the market would have had nowhere to go while waiting for Metrolinx to release the site. This week, in a new location and layout, the market looked much more like a market from the street and if there was any doubt, the B.I.A.’s Deborah Gibson was pulling in passing traffic in fine carny barker style. Deborah Gibson from the BIA encourages passing traffic to try the market. The larger space of the Metrolinx lot allows for a better arrangement of stalls that has much more appeal from the street. Now that’s what a market looks like. Wychwood Barns it ain’t but perhaps that’s not such a bad thing. Those two SUVs are still blocking the view (we’re talking to you smoothie man and Grandpa Ken). Grandpa Ken’s bacon sandwiches are still big sellers. Perhaps Grandpa Ken could encourage his clients to line up so that they don’t block access to other traders. Masum also mentioned that the market area is patrolled on Friday nights until early on Saturday mornings and then cones are strategically placed so that people aren’t tempted to park overnight in the market area. Councillor Frances Nunziata was there keeping an eye on things (you can see her in the second photo far left). Traders I spoke to seemed pleased at the numbers this week and the weather cooperated. It also helps that there is a large amount of fresh Ontario produce available, much of which comes directly from farms and orchards. I bought some peaches and they were delicious. Is it too much to hope for a beer garden? Kathy Haley a scapegoat? Not so much. Kathy Haley has resigned as head of the Union Pearson Express effective March 31st. She has been employed by Metrolinx since July 2011 and came in with high hopes to run a successful airport express. There are two interesting videos on YouTube that encapsulate the hopes and aspirations of Ms. Haley and they certainly don’t seem to mesh with reality. Watch this first video taken in Vienna when she confidently announces, “I’m developing and building a new air-rail link for Toronto”. Along with giving the impression of building the train single-handed, she frames herself as a person able to explore and adopt the needed expertise. In the second video, taken in late 2014, Ms Haley makes some excellent points about marketing and the customer, “If you put the voice of the customer on the table, it’s hard to argue with his or her voice”. Unfortunately those words were uttered just months before the UP Express opened in July 2015 with outrageously high fares. Presumably once the train began running, it became hard to listen to the customers because they were nowhere to be found. Once the UP Express was up and running, Ms. Haley became its official cheerleader and her new goal was to get more bums on seats. The bean counters in the Ontario Liberal Government had decided that operating costs had to be recouped through passenger revenue and Ms. Haley was given the impossible task of encouraging people to pay exorbitant fares that were devised by and approved by the Ontario Government through the nodding heads of the Metrolinx Board. All this in spite of the Auditor General’s advice (based on Metrolinx’s own figures) that ridership would be low and a fare price over $22.50 would be too high. The Board decided that regardless of the reality, high fares would not be a problem for the target customers (presumably those mythical captains of industry for whom money was no object). As the months dragged on with no significant change in ridership, Ms. Haley was regularly seen earnestly arguing that despite the awkward facts, passenger numbers really were improving and a breakthrough was imminent. This flew in the face of many anecdotal reports of almost empty trains. Each grudgingly parsimonious fare promotion and discount was greeted with excitement by Ms. Haley and with a yawning indifference by the public. Bums remained off seats. The final straw came during the most recent Valentine’s Day giveaway when hordes of people waited for hours to try out the service. The glaring gap between the huge interest in UPX and Ms Haley’s declaration that ‘once people know that we’re here, passengers will flock to the service’ simply became untenable. The truth was quite simple. Fares were too high. Their reduction finally came about through a humiliating but necessary intervention by the Premier. Already passenger numbers have doubled as fares have become affordable. Weston residents have a fast portal to downtown for a reasonable cost. It’s hard to feel sympathy for someone who earns an such an awesome salary ($249,020.54 in 2012). No doubt she has a golden parachute to soften the landing until the next well-endowed gig comes along. While her resignation is understandable, the other players in this debacle (in the immortal words of Ricky Ricardo), “Have some ‘splainin’ to do”. These would be the Metrolinx Board of Directors, Metrolinx Chair Robert Pritchard, CEO Bruce McCuaig and Transportation Minister Steven Del Duca. Last but not least, the Premier was herself Transportation Minister in 2010 when private consortium SNC Lavalin pulled out of building UPX when it was clear there was no chance of making a profit. She knew the task was impossible from the start. Wouldn’t it be nice if all players acknowledged their individual blame in this sequence of events instead of hoping that Ms Haley’s departure will clear the air? Some more resignations would not go amiss. Chicago Mayor Rahm Emanuel is investigating the possibility of emulating Toronto and building an express train that would take passengers from O’Hare Airport to downtown. Yesterday, Chicagomag.com published an article warning against this and declares Toronto’s UP Express to be a failure. Read all about it here. The third issue that we discussed was Metrolinx and transit implications for Weston. Prior to winning a seat in the House of Commons in 2011, Sullivan was co-chair of the Clean Train Coalition, a grass roots community group dedicated to electrification of the rail lines that run through what used to be known as the Georgetown Corridor. He was a vocal critic of the Airport Rail Link before it became known as the UP Express. For a flashback to the past, this interview with Sullivan is a good refresher on the issues back in 2010. Sullivan is still keenly interested in transit as it pertains to Weston. We started with the new GO Station parking lot and and its role as host to the Weston Farmers Market for the foreseeable future. 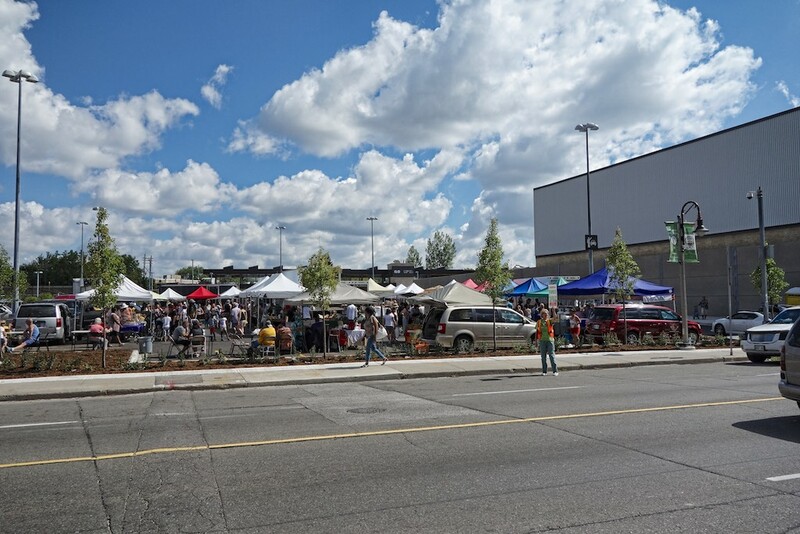 Metrolinx is giving the farmers market (the GO Station Parking lot) for free for the next couple of years because there are no GO Trains on Saturdays and because you’re not allowed to park overnight on that (GO Train) lot. No one will use that lot to take the Airport connection. When Metrolinx was first talking about the quantities of parking that they were going to need, I got the impression that because they were going to market the link as an alternative to parking at the airport so you would pay $16 each way for the ride and park for free. And so that’s why they’re building that massive lot at the south end for the GO patrons and the North end will be potentially long term although Metrolinx told me that they have no intention of doing that they’re so desperate for ridership and ours is the only station where there is any possibility of parking. Between Mayor John Tory’s SmartTrack and the new LRT line, many have been wondering what will happen to Weston’s GO and UP Express stations once the LRT is complete. A new Mount Dennis station will be located uncomfortably close to Weston. Watch this dream-like video. Notice the connections to GO and UP Express marked on the station entrance. Read more about the station here. Sullivan spoke briefly about the way the New Eglinton LRT line will disrupt everything. When the Eglinton LRT is opened, the UP Express and GO train will stop at Eglinton. That’s not good if you live in Weston. The implication being that having two stations so close together will be mean that one will have to go. In other words, the least useful will become redundant and that could be Weston because it’s not a major transfer point as a triple rail intersection would be. The Mount Dennis Station will allow a transfer between GO, the UP Express, the Eglinton LRT not to mention the hastily planned election promise that was SmartTrack. Weston may have another fight on its hands if it is to keep its two stations. Sullivan moved on to the expensive and barely used UP Express and is sceptical about the latest Metrolinx UP Express ridership numbers. UP Express claimed October ridership was higher in October but they didn’t take into account the fact that October has an extra day. When asked to comment on the ticket prices charged by UP Express, Sullivan claims that the cost of running UPX is about $5 per fare. If this is the case, Metrolinx has lots of room to manoeuvre. Rumblings have already started about a really competitive fare that would boost ridership numbers. No doubt the New Year will bring a sober second look at prices. Tomorrow: The Church Street, former Humber River Regional Hospital Site. Weston is about to get much noisier. Metrolinx is abandoning its plans to build some of the noise walls that would have dampened noise from the new airport trains. Pedrosa says there will be no noise walls on the “strutted area” of the tunnel. This includes the areas between, roughly, John and Queenslea (in purple). 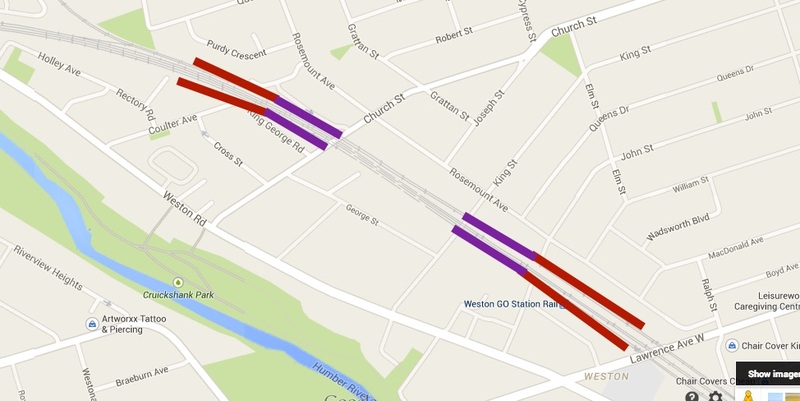 It is not yet clear whether there will be noise walls in the other areas of the Weston tunnel (in red). Pedrosa said “We are currently reviewing the constructability [sic] of the other planned noise walls in the area”; I have asked him for clarification. I have also asked him to clarify the effects on nearby properties and the farmers’ market. In the Junction, they do not want walls, but they’re getting them. In Weston, we want them but we are told we can’t have them.